For 15 years, Jim Butcher has been keeping us guessing with his twisty urban fantasy series, The Dresden Files. But now, he's changing gears and launching a Horatio Hornblower-esque new series, The Cinder Spires. 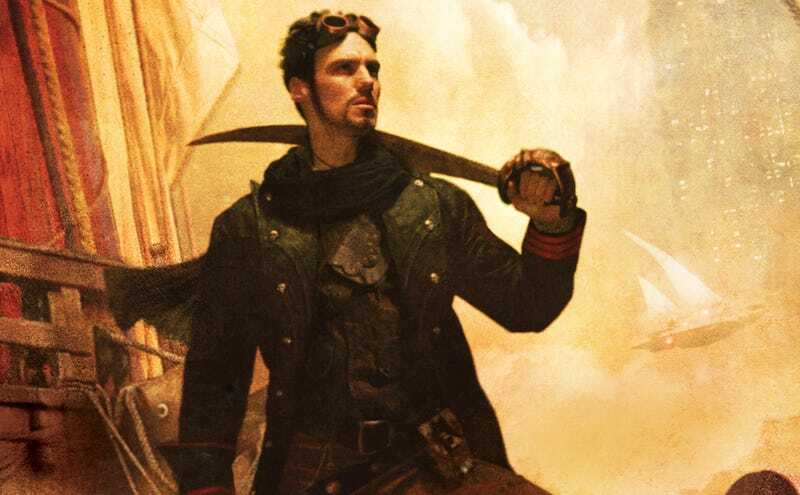 Check out the cover of the first book, The Aeronaut's Windlass, and an excerpt, exclusively at io9! The Aeronaut's Windlass comes out in late September. It's jam-packed with airships, crazy sorcerers, privateers, warrior monks, and intelligent cats. An ancient evil has rewoken, and the entire world is plunged into a sinister mist, filled with terrible creatures. Grimm stood firm as Journeyman cut the power to the lift crystal's suspension rig, and Predator dropped from the sky like a stone. An attack dive was a small vessel's maneuver. The actual fall would inflict little damage on a vessel of any size, but the sudden reduction of speed on the far end of the dive could be a severe strain upon her timbers. Larger ships, with their far heavier armor, suffered more from such pressures, and in order to decelerate slowly enough to ease those strains, a large ship had to lose so much altitude that it often could not return to the level of the engagement effectively. A truly efficient combat dive required a brief, severe period of reduction in speed, and Grimm had read accounts of battleships and dreadnaughts which had attempted a dive, only to have their lift crystals tear themselves entirely free of the ship when they attempted to arrest their descent too rapidly. Sane captains rarely tried a combat dive with anything heavier than a light cruiser—but for a relatively tiny destroyer-sized ship like Predator, the dangerous feat dwelled at the heart of battle doctrine. Kettle kept his hands firm on the control grips, riding the ship into the dive, keeping her steady with the maneuvering planes mounted on her hull and in her tail. The etheric web still hauled the ship forward as before—but now she was rushing down as well, coming toward the Auroran ship almost directly out of the midday sun. The deck began to buck and jolt as their speed built. Timbers moaned and flexed in protest, the pitch rising steadily. Only the safety lines of his harness held Grimm in place, and he was once more glad to be a man of only middling height—poor towering Creedy was trying to imitate Grimm's stoic posture, and his head was being yanked about randomly as the ship bucked its way into battle. The Auroran grew larger and larger, and the sound of Predator's straining timbers continued to rise in tone and volume. All ships made their own individual sounds during a dive, though no one was sure precisely why. Grimm's midshipman's tour had been aboard a destroyer named the Speck. It had howled like a damned soul when it stooped upon a victim. Other ships wailed like enormous steam whistles. Still others took up a regular pounding rhythm, like the beating of some vast drum. Once, Grimm had been aboard the light cruiser Furious, which literally boomed out enormous snarls as it charged to combat. But his ship outdid them all. When Predator sailed into war, she sang. The rapid winds and rising shrieks suddenly blended into a single harmonious tone. Lines in the rigging and the yards and the masts themselves quivered in time, and began giving off their own notes of music, in harmony with one another. As the speed increased, the chord rose and rose, and built and built, until it reached a crescendo of pure, eerie, inhuman fury. Grimm felt the music rise around him, felt the ship straining eagerly to her task, and his own heart raced in fierce exultation in time with her. Every line of the ship, every smudge upon her decks, every stain upon the leathers of his aeronauts leapt into his mind in vibrant detail. He could feel the ship's motion, forward and down, could feel the wind of her passage, could feel the rising terror of his crew. One of the men screamed—one of them always did—and then the entire crew joined in with Predator, shrieking their battle-cries together with their ship's. The ship would not fail them—Grimm knew it, he felt it, the way he could feel sunlight on his face or the rake of wind in his hair. And he also felt it the instant that their speed, their course, and their position were absolutely perfect. "Now!" he thundered, raising his arm in a single, sharp motion. Kettle pulled the altitude throttle from zero back up to its normal neutral buoyancy, and hauled hard on the steering grips. Though Grimm couldn't see it, he knew what was happening. The engine room would have seen the throttle indicator and even now Journeyman and his assistants would be unleashing power from the core crystal back into the lift crystal again, and the ship suddenly groaned as she began to slow. At the same time, Predator pirouetted upon her center axis, leaning over to her port, and brought her port-side broadside to bear upon the Auroran ship. Even with the protection of his goggles' dark lenses, the flash of seven etheric cannon forced him to wince and look away as they sent their charges screaming toward the Aurorans. Each cannon was a framework of copper and brass around a copper-clad barrel of steel. A row of weapon crystals was suspended in the exact center of the barrel's length upon copper wires, and when the weapon was activated, it behaved in much the same manner as a common gauntlet—except on a far larger scale. Then the energy of a cannon crystal was added to the outgoing rush of power, and the result was pure destruction. A cannon bolt unleashed massive energy upon impact. A single hit from one of Predator's cannon, if placed in precisely the right place, could incinerate most of an unarmored vessel. Seven such weapons turned their fury upon the Auroran ship, targeting the tips of her masts, where her etheric web spread out around her. Grimm watched intently for the results of the first salvo. In theory, the light cannon aboard Predator could fire a bolt that would strike effectively from nearly two miles away. In practice, it took a steady ship, a steady target, skilled gunners and no small amount of luck to hit something at more than half a mile, perhaps more if they used the heavier chase gun, Predator's only medium cannon. A light ship's defense was in its agility and speed, and they rarely cruised stably when they went into battle. Such cold-blooded trading of fire was for the heavier warships, armored to withstand multiple hits and carrying weapons ten times the size of Predator's arms. His gunnery crews were all veteran aeronauts of the Fleet, and he would match them against any active warship's crew. Though Predator was moving swiftly, the target stood barely two hundred yards off her beam, and the men had known the exact angle at which Kettle would hold the ship. Ships did not dodge broadsides at this range. One could hardly see a cannon's blast in flight. It simply moved too quickly. There was the flash of the gun and the flash impression of a glowing comet dragging a tail of sparks, and then impact upon the target, with a barely detectable delay in between. Not a single crew missed its target. And not a shot landed. Instead, there was a flash of emerald illumination perhaps twenty yards short of the enemy vehicle, as the cannon blasts struck the enemy ship's shroud. The shroud was a field of energy generated by a ship's crystal power core. When a cannon blast struck the shroud, it illuminated like a hazy, spherical cloud flickering with lightning, absorbing the incoming fire and dispersing its energy safely before it could strike the ship. Shrouds were a strain upon a ship's core, a tremendous demand upon the core's energy reserve. One did not simply sail along with the ship's shroud raised and in place. Grimm's eyes widened as time seemed to stop. Predator's cannon had ripped deeply into the enemy's shroud, the energy of the blasts chewing away at the defensive field, almost all the way to the Auroran's hull. But they had not inflicted any damage. The Auroran vessel's shroud was up and in place. Therefore she had seen Predator coming. Therefore she had been watching. Therefore the Auroran had intended to be spotted, sitting fat and lazy on a sluggish current just above the mezzosphere, a perfect target—and she would be ready to return fire.